Dumbbells come in different sizes for different tasks. You have to be smart to get the most from your dumbbells. That’s because dumbbells are versatile tools that offer many options. For example, you can use light dumbbells to perform high-repetition exercises or heavy dumbbells for low-rep routines. 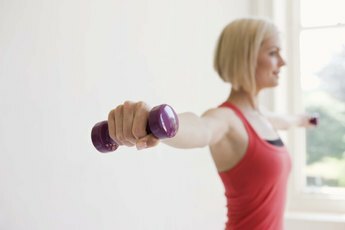 You’ll typically engage more stabilizing muscles with dumbbells than with exercise machines. Dumbbells also may offer a greater range of motion than a barbell -- when you do bench presses, for example -- because there’s no middle bar between your hands. Whatever your exercise goal, the chances are good you can accomplish it by using dumbbells. Learn the proper form for all of your dumbbell exercises. Book at least one session with a personal trainer, go through your complete routine and let the trainer correct any mistakes. If you use improper form when you’re working with dumbbells, you probably won’t receive the full benefits of your exercises. At worst, using improper form can result in an injury. Warm up your muscles before you begin a dumbbell workout. Perform five to 10 minutes of light aerobic exercise, enough to break a bit of a sweat, then do some dynamic stretching of the muscles you’ll work during your routine. You can add some static stretches after your dumbbell workout is complete. Lift or hold a dumbbell in each hand to work both sides of your body in many exercises, or grasp one dumbbell at a time to focus more closely on one area. If you do biceps curls, for example, you can hold one dumbbell, perform your desired number of reps with one arm, then switch to the other arm. You can also hold two dumbbells and either lift both simultaneously, or alternate arms while you lift one dumbbell at a time. Perform dumbbell exercises while you’re standing, seated or lying down. Some dumbbell exercises, such as lunges, must be performed while standing, while exercises such as bench presses require you to lie down. Other exercises -- shoulder presses, for example -- can be performed while you’re standing or seated. Standing exercises typically require more stabilizing muscles, while seated exercises focus more directly on the targeted muscles. Hold a dumbbell in each hand while you perform squats and lunges to work your thighs, or calf raises for your calves. Strengthen your abs by performing dumbbell side bends or pullovers. Work your upper body by doing dumbbell shoulder presses, plus lateral and front raises for your shoulders. Use dumbbells to perform bench or incline presses, or flyes, to build your chest. Hold a pair of dumbbells while doing shrugs to strengthen your back. 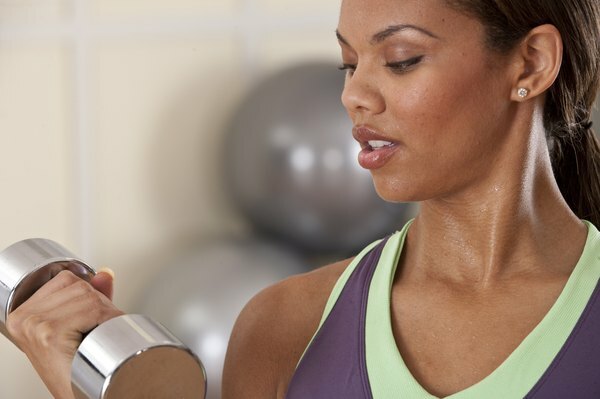 Do a variety of curls, kickbacks and triceps extensions to work your arms. One-arm dumbbell rows will work a variety of upper-body muscles. Use a spotter if you lift heavy dumbbells, particularly if you lift them over your head. Dry your hands or wear gloves if your palms become sweaty, to make sure your grip on each dumbbell is secure. You may think that using a lightweight dumbbell is completely safe -- until it slips from your hand and lands on your foot.